Just looking at the genetics of the original Super Silver Haze, or “SSH” as some cannabis enthusiasts call her, a creation made from a classic Skunk, Northern Lights and an original Haze shouldn’t leave a doubt about the quality of this sativa. In the past, many SSH lovers happily accepted the fact that Hazes normally take longer to flower because they're saying that the reward at the end is sure making up for the wait. 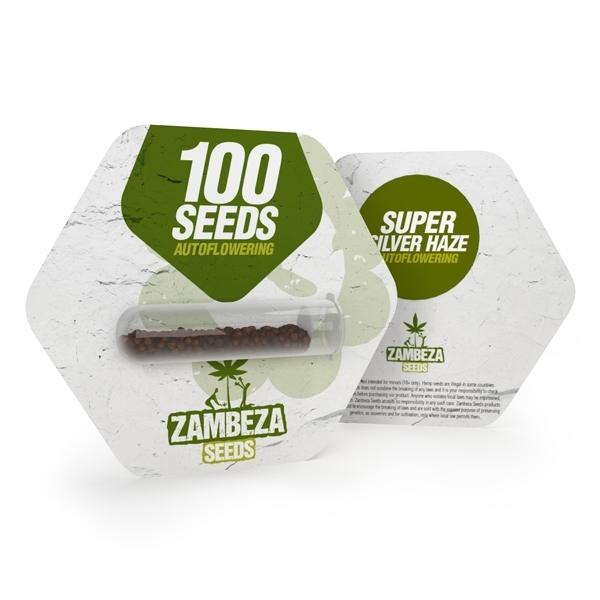 Zambeza, however, was aware of that there was a demand for a top autoflowering variant of SSH where they also managed to cut down the wait to a reasonable 70-85 from seed to harvest. Compared to some other autoflowers, Super Silver Haze Autoflowering can get relatively tall indoors with a maximum height of 80-110cm. Indoor yields of up to 300g/m² are definitely another big bonus for those who grow her. Outdoors, she can reach up to 150cm with yields of up to 170g per plant if she gets enough sun. On paper, the 17% of THC of SSH Autoflowering may look like she’d maybe only deliver a moderate effect, but don’t let this fool you. In fact, she’s so potent that you will likely only need a tiny amount of bud to get the effect that you want! She’ll give a very uplifting and happy high that comes with a boost of creativity and energy which makes her the perfect daytime smoke for all sorts of activities! But the superb high of SSH Autoflowering is not all that you can expect when you smoke her. She’ll deliver a light and smooth, very pleasant smoke that blends sweet and spicy notes with some citrus tones in perfect harmony. Zambeza created a spectacularly good autoflowering variant of the famed Super Silver Haze that won’t disappoint. She’ll deliver pretty much all that cannabis connoisseurs love from the original SSH but now without the long wait and without any growing hassles. This makes Super Silver Haze Auto a great strain not only for expert growers but also for those with less experience who want to enjoy what this great sativa can offer! Super Silver Haze bulk seeds are available in packs of 100 seeds each which makes them a good choice for everyone who wants more seeds of this outstanding Haze.